A boat is a very large investment and one of the best ways to protect your investment is with a boat cover to protect it from the sun's uv rays and the elements. Some people see a boat cover a nice accessory to have but don't want to spend the money on a cover because they only see the extra cost however there are several reasons why you should have a cover for your boat. Now that we know some benefits of owning a boat cover, let’s look at some things to consider when purchasing one. Depending on how you will use it, we have three basic types of boat covers; storage cover, trailer cover and mooring cover. 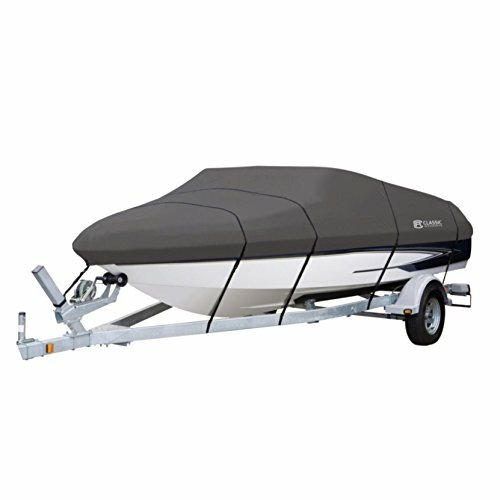 Storage covers are designed to store the boat while it is out of the water; either indoors or outdoors. The fabric can be a lighter material if the boat is to be stored in a secured place. A water-resistant fabric will be required for a moist place and a UV resistant one is recommended if the boat will be outdoors. Trailer covers are stronger than storage covers. They are designed to withstand strong winds, hostile weather conditions and have a tight fit. They are made from durable fabric with UV coating such as marine polyester to protect the boat from cracking and fading due to the sun’s rays while on the trailer in transit. Universal-fit boat covers are designed for broad models while custom-fit covers are designed for a specific boat but cost quite a bit more. Universal-fit boat covers tend to be big and looser fitting. They are usually offered in two-foot increments and are not perfect for trailer use. Most, universal covers are inexpensive and are available in a variety of colors. On the other hand, custom-fit boat covers have less fabric and will provide the best fit compared to a universal-fit cover. They are built to also function as a trailer cover. For durability and effectiveness, you need to select a boat cover with the right fit by having the right dimensions. For the length, measure from the tip of the bow to the center of the transom on a straight line. Include anything protruding past the stem if not a motor or motor mount. Excluding bumpers and removable items, measure the widest part of the boat. For both length and width, do not include items such as seats, rails, or windshields. The fabric of the boat cover should be chosen dependent on whether you will be transporting your boat on the road or not. The environment the boat will be stored is also an important consideration. Waterproof and water resistant fabric is recommended if the boat will be stored in a humid area and a highly water-resistant fabric if the boat is to be stored outside. A cover that fits tightly on the boat and is weather resistant is recommended if the boat is going to be transported along the highway. Always consider a material that is durable and easy to clean for your convenience. Don’t put in the dryer or washer. Don’t use a scrub brush or bleach. This heavy-duty boat cover by MSC has solid construction and heavy-duty marine grade polyester that is durable and highly water-resistant. It is also mildew and UV resistant to protect your boat’s interior from cracking and has a double coating for enhanced strength. This boat cover can be used for long-term storage, mooring and trailing. It has a great fitting thanks to the adjustable straps whose buckles are easy to release. The hem has an elastic cord sewn into the bottom to add to the tight fit. When not in use, it comes with a canvas storage bag so you can fold and easily store the cover. You will love that the MSC boat cover does not get dirty easily and is very easy to clean. Its available in six colors and sizes. The Seamander 600D Boat cover is the best boat cover for everyday use. It is made from 600D marine-grade woven polycanvas that is not only durable but also highly waterproof and UV resistant to keep the boat from cracking and fading due to the sun’s rays. The material repels snow, rain and other elements. Its breathable fabric will prevent the growth of mildew and mold when the boat is stored in a humid area. The cover is quick and easy to install and its surface is very smooth to prevent scratches on the boat’s exterior surface. The easy to fit strap system and ability to stay on even in strong winds makes this a great boat cover to use when transporting your boat short distances. When not in use, you can store the boat cover in its mesh bag. It’s available in 4 colors and 3 sizes. The Leader Accessory cover boat is made of ShoreMaster 7.25 oz. 600D marine grade polyester fabric that is urethane coated making it more durable. It is also water, mildew and UV resistant to prevent the boat’s interior from mold and cracking. It is ideal for both trailing and storage. It has an elastic cord at the bottom to help ensure a tight fit. The air vents at the back allow moisture to escape. It is easy to fit thanks to the quick release buckles and strap system. Your boat’s key parts will have extra protection from the reinforcements on the back corners, the middle and the front. It comes with a mesh storage bag to store the cover when not in use. It’s available in 5 colors and 3 different sizing and fits most hull styles. The AmazonBasics is a custom-fit boat cover for V-hull runabouts and bass boats. It is made of 100% polyester thus durable. The fabric also does not stretch or shrink ensuring it offers a secure fit for long. You will love that it is waterproof and easy to clean. 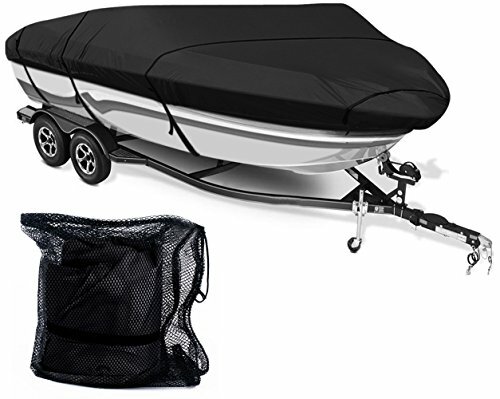 Designed for both storage and trailing, this AmazonBasics boat cover has adjustable straps that fit underneath the trailer thus protecting your boat’s paintwork. It also has vents to allow moisture to escape. 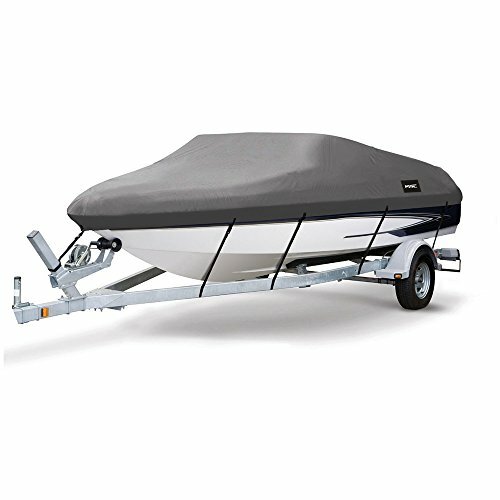 The Classic Accessories StomPro boat cover has been designed to be extra durable. The fabric won’t shrink or stretch giving you a tight fit for man years. It is water, mildew, UV and all-weather resistant. You will love that it can be used on boats with windshields and those without. The Classic Accessories StormPro boat cover comes with a support pole that prevents water from pooling on the cover for increased durability. The two air vents at the back will reduce wind pressure and allow moisture to escape preventing mildew and molds. 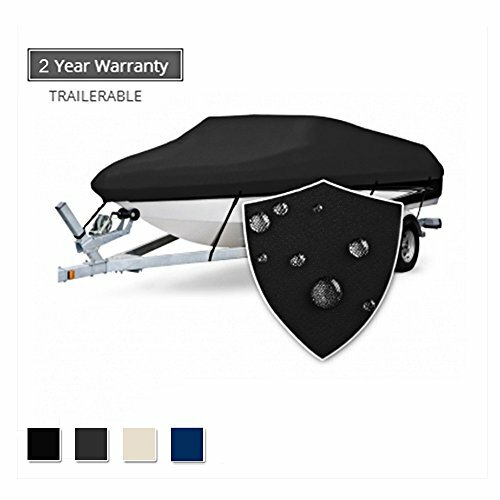 This trailerable boat cover is easy to fit thanks to the integrated buckles and strap system. The elastic cord at the hem offers a tight fit and it also comes with a storage bag to store the boat cover when not in use. 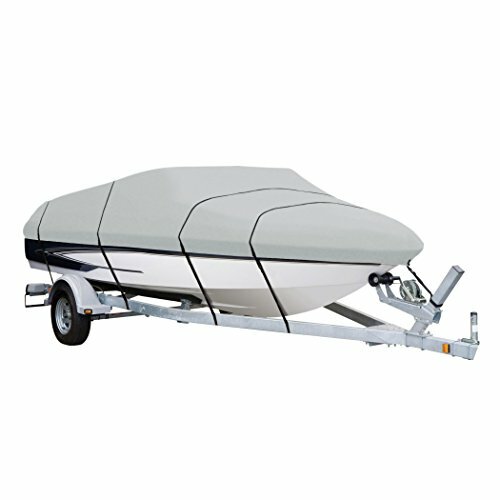 The market offers a number of boat covers with different features making difficult to select the best one for you. 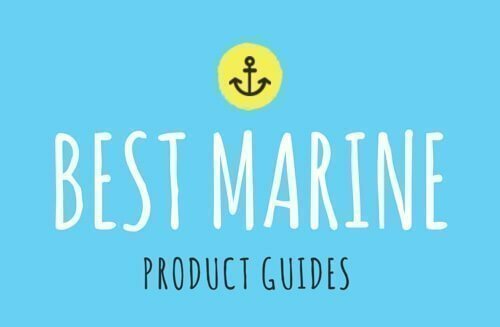 However, with our top 5 boat cover reviews above, we hope you now have the information you need to select one based on your needs. We have considered a number of features to help make it easier for you.